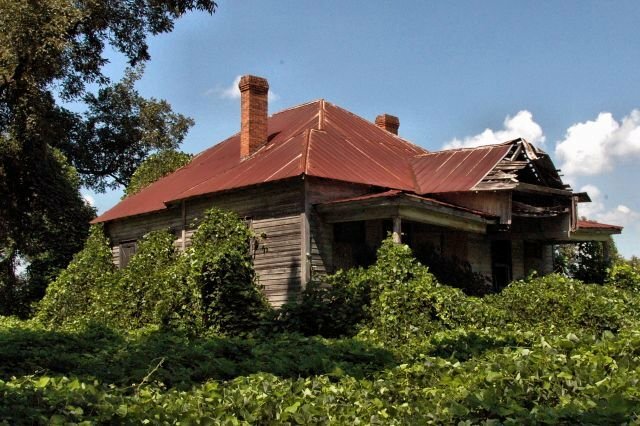 Surrounded by kudzu, this old farmhouse looked quite vulnerable when I photographed it in 2010. As of 2016, I don’t know if it’s still standing. It was located near Mount Enon Church. Bill Blackburn writes: This is the Sam Collier house on Stagecoach Road in the Gum Pond Community south of Mt Enon Church. I remember their children were Samuel Jr., Rita and Rosalyn. I rode the bus with them in the mid-1960’s to Baconton School. In 2015 I stopped and spoke to a relative of theirs who was deer hunting on the property so I assume it remains in the Collier family. I used to live at the crossroads between the Colliers and Baconton. They were fine people. The house was painted white and was well kept. Is this on the corner of Stage Coach Rd and Hwy 111? How long before it’s completely covered? 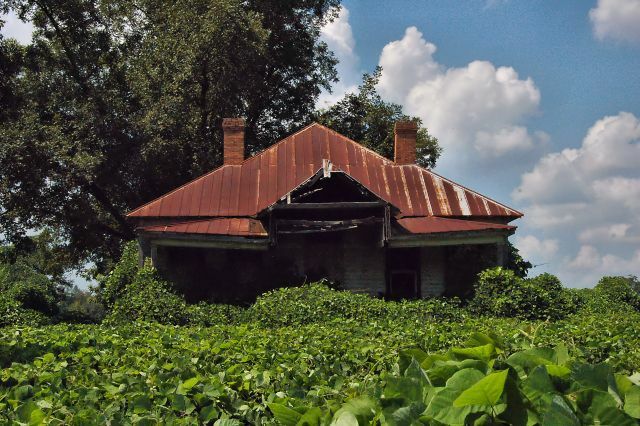 If we could find / develop a market for Kudzu, our economy would certainly take a giant leap forward. What an epitaph we leave when, by neglect, we allow nature to reclaim what was once hers, from the beginning. I agree, Tom. We’d all be rich if there were as many uses for kudzu as for peanuts! This is the Sam Collier house on Stagecoach Road in the Gum Pond Community south of Mt Enon Church. I remember their chjildren were Samuel Jr., Rita and Rosalyn. I rode the bus with them in the mid 1960’s to Baconton School. In 2015 I stopped and spoke to a relative of theirs who was deer hunting on the property so i assume it remains in the Collier family. I really appreciate the work you’re doing here. I have also been documenting abandoned rural structures for years. I assume you are familiar with William Christenberry! See my blog and in particular my “dying…” series. What a beautiful front porch with the extended entry architectural feature – You wonder who in the family that built it came up with that feature – I have never seen anything like it! Thank you for your posts. We rescued an old house which gives us the delight of living in an antique. I bemoan all those good heart pine houses that go to pot – many times with a trailer parked in front where the owners live!